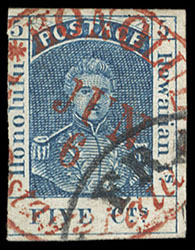 Hawaii, 1853, 5¢ blue, thick white paper, central red "Honolulu, U.S. Postage Paid" circular date stamp and San Francisco transit corner cancels, margins large to just in at left, rich color, F.-V.F., quite attractive. 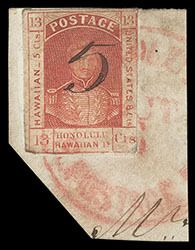 Hawaii, 1853, 13¢ dark red, thick white paper, without gum, clear to ample margins, rich bright color, slight scuffing at bottom, Very Fine appearance. 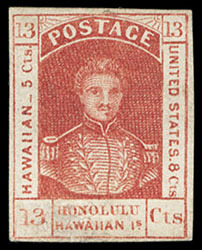 Hawaii, 1857, 5¢ manuscript surcharge on 13¢ dark red, type II (Jackson) surcharge, tied to small piece by red Honolulu cancel, full margins to just in, small unobtrusive surface scrape at lower right, Fine appearance, an attractive example of this scarce stamp which is rare with the Jackson surcharge; with 1994 PF certificate. 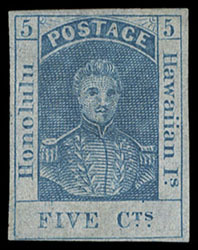 Hawaii, 1857, 5¢ blue, thin white paper, left margin single, without gum, margins ample to just shaving frameline at bottom left, strong vibrant color, F.-V.F. ; with 2013 H.P.S. certificate. 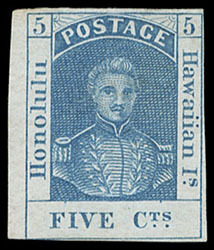 Hawaii, 1857, 5¢ blue, thin white paper, line through "Honolulu" variety, position 2, without gum, clear to huge margins, rich color on bright fresh paper, tiny thin, Very Fine appearance; with 2015 P.S.E. certificate. 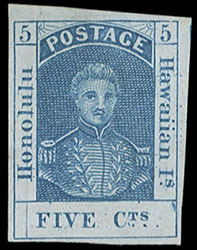 Hawaii, 1861, 5¢ blue, thin bluish paper, without gum, clear to mostly ample margins, rich color, Very Fine. 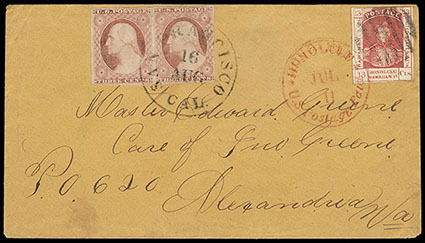 Hawaii, 1861, 5¢ blue, thin bluish paper, margins large to in at bottom, tied by square grid handstamp on piece, with full strikes of red "Honolulu, U.S. Postage Paid, Nov 1" origin and "San Francisco, Cal., Dec 5, 1863" transit cds's; stamp with few minor wrinkles, Very Fine appearance. Scott No. 9 Estimate $200 - 300. 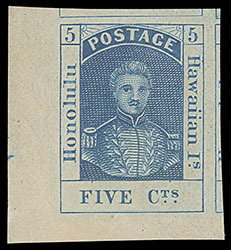 Hawaii, 1868, 5¢ blue, re-issue, bottom left corner margin single, o.g., never hinged, huge margins showing portions of all adjacent stamps, bright and fresh, a Superb gem; with 2018 P.S.A.G. certificate (Superb 100). Scott No. 10; $28 for hinged Estimate $250 - 350. 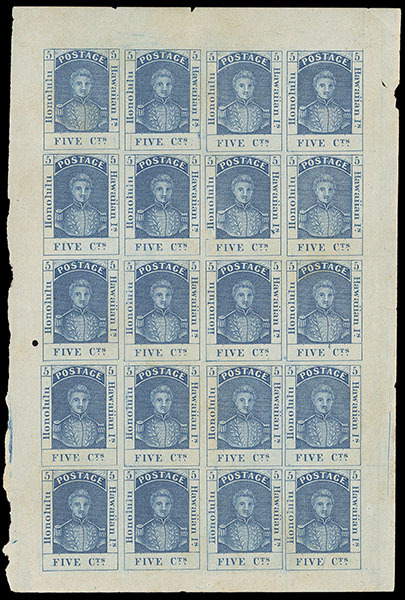 Hawaii, 1868, 5¢ blue, re-issue, complete sheet of 20, o.g., never hinged, rich color, central vertical crease between stamps and small selvage flaws, otherwise Very Fine. Scott No. 10, 10a $925 for hinged.